An inspiring and intensive three-day event brought together ten participating projects from the Turkish community in Germany, the Afro-Caribbean and Asian communities in the UK and the Chinese and Maghrebin communities in France, with the addition of a Macedonian Swiss project. Prize-winning filmmakers such as Raja Amari (France) and Ayse Polat (Germany) compared experiences with relative newcomers reaching out to the European mainstream. The Goethe Institut's Rotterdam town house offered a stylish oasis of calm opposite the hurly-burly of the film market at IFFR's Doelen, thanks to principal funders CNC (Centre National de la Cin�matographie), the Goethe-Institut, the British Council and the UK Film Council. The workshop concentrated on personal creative exchanges, screenplay development and finance strategies. Plenary sessions with tri-lingual interpretation alternated with individual project consultancy with Scenario's Fiona Howe and Gareth Jones, Cin�-Sud's Thierry Lenouvel and Christoph Thoke of Mogador Films. Industry speakers from the IFFR and Cinemart included Michel Reilhac (Arte), Burkhard Althoff (ZDF), Georges Goldenstern (Cin�fondation), Alan Fountain (EAVE) and Jerome Paillard (Cannes Producers' Network). 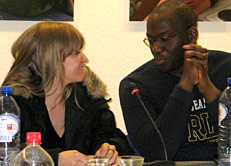 At the conclusion of the final session, French participant Jilani Saadi, whose La Tendresse du Loup was showing at the IFFR, proposed the extension of the BABYLON programme to a pan-European network of multi-cultural film production and distribution, a proposal which was unanimously carried and which producers Scenario and Cin�-Sud are continuing to pursue with national and European bodies. Projects attending Producers Network were Jilani Saadi's L'Impossible Testament, with producer Imed Marzouk of Propaganda Production, Tunisia; Show-Chun Lee's Shanghai Belleville, produced by Juliette Grandmont of Charivari Films, France and Black Market, produced by Anthony Alleyne and Rachel McClelland of Rebel State Films, UK. Projects attending the Cannes Market were Swiss-Macedonian director Mitko Panov's The War is Over, produced by Mitko Panov and Israeli producer Assaf Shapira; Burnout (Formerly Alpenhof) represented by writer/director S�lbiye G�nar, with producer Christoph Thoke, and Flieh Elif Flieh represented by writer/director Seyhan Derin. The week combined various networking and financing events with ongoing project consultation from Fiona Howe, Gareth Jones, Thierry Lenouvel and Christoph Thoke, all of whom attended the Producers Network. Participants also enjoyed privileged access to screenings and parties! A conference at the Institute of Germanic & Romance Studies, University of London, Senate House, organized by AHRC Research Network on Migrant and Diasporic Cinema in Contemporary Europe. 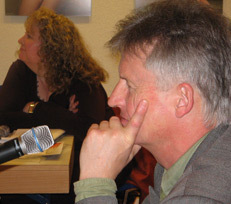 BABYLON co-producers Gareth Jones and Thierry Lenouvel presented the BABYLON Programme in relation to the European Film Industry. Screening of his most recent feature The Assassinated Sun at the French Institute's Cin� Lumi�re in London. S�lbiye G�nar took the platform with Gareth Jones, Fiona Howe and Peter Zawrel of Film Fonds Wien to present the Babylon experience to assembled film makers. 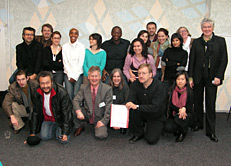 Back row L-R Ayhan Salar, Michael Koller, Juliette Grandmont, Victoria Hayford, Ayse Polat, Anthony Alleyne, Seyhan Derin, S�lbiye G�nar, Mitko Panov, Cathleen Haff, Raja Amari, Suzanne Forsell-Thiebaut, Thierry Lenouvel; Front row L-R Malte Y�cel Can, Jilani Saadi, Gareth Jones, Fiona Howe, Christian L�ffe, Show Chun Lee. Photo credits: Fiona Howe, Seyhan Derin.